As the opening poem “The Labyrinth Galaxy” suggests, this is not a book of astronomy, but a book of seeking and beseeching. 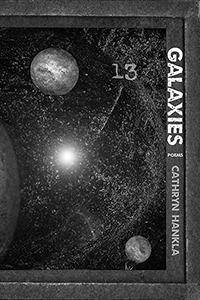 Cathryn Hankla’s GALAXIES forms a collective of connected but disparate things. Each galaxy grouping constitutes a gravitational system of concern, finding its own music and approach to what a poem can be. Together the poems create a spiritual pilgrimage, a sequence sending up an alarm for the earth, inviting the reader to walk a path to the heart’s center. As attentive to the natural world as to human emotion, Hankla has previously written prose poems and lineated verse in traditional and open forms, but in this inventive volume she allows each poem to follow its own trajectory, map its own metaphorical universe—to reveal the extraordinary range under this poet’s command. Hankla shifts through high and low registers, in a voice droll and urgent by turns, always observant and skillful at her craft. “You will meet your god in the present moment,” Cathryn Hankla writes, and her poems, emanating from that promise, contemplate and honor the largest questions. The multiverse of this quietly mind-blowing book is composed of imagined constellations. There’s a profound delicacy throughout, a candor tempered by compassion. Reticence has seldom seemed so provocative or quietude so dazzling. In GALAXIES, one cannot escape the influence of the stars. The stars followed lead us often astray into the unexpected, the wonderful, the off-kilter, and the strange. If fate is a road followed, it is full of switchbacks, dangerous curves, washed-out roads, detours, and dead ends. But what a journey Hankla takes us on. In GALAXIES, “language grows like fescue” and the patterns that she creates with it spiral upward from earthbound fact and observation to stellar connections and intuitions. The poet's ability to suggest these many worlds, both seen and unseen, result in poems of lyric capaciousness, thoughtful, intricate, and enticing. The finely crafted poems in GALAXIES have a quiet power, a solid emotional core enhanced by playful language that never fails to attract the ear. Both earthy and otherworldly, the poems contained here make lovely leaps of sound and sense, but always return to their task of comprehending the infinite galaxies that hold and define us.